Richard Gould was the son of Thomas Gould 1752-1829 and his wife nee Frances Hunt. He was born in 1792 in Bakewell, but was not baptised there. On 10 December 1817 he married Susan Bateman 1795-1828 by licence at St John's church in Manchester (1). She was the youngest daughter of James Bateman of Tolson Hall in Westmoreland and his wife Margaret Nicholson, daughter of Edward Nicholson who was a merchant in Kendal. At the time of their marriage Richard Gould was living at Willow Bank in Broughton, and Susan Bateman at Islington House in Manchester. Susan Gould. She was baptised on 10 May 1821 at St Stephen's church in Salford. She was married to the Reverend Henry Milne 1815-1880 in 1842 at Eccles near Manchester, and died on 27 October 1905. Frances Gould. She was born on 1 February 1825, and baptised on 3 July 1825 at St Stephen's church in Salford. In 1845 she was married at Eccles to Major-General John Hinde 1814-1881 CB. Richard Gould's wife Susan Gould died on 14 May 1828, and was buried on 22 May 1828 at St Stephen's church in Salford aged 33 years. On 23 November 1831 he married Eliza Sergeant, the daughter of William Sergeant of Manchester, attornery at law. She was born in Stretford near Manchester in 1797. In 1851 Richard and Eliza Gould were living at Pilkington, Stand near Bury in Lancashire. He was then a merchant in cotton yarn, also farming 60 acres and employing two men. The domestic staff were four female servants and a coachman. In 1861 Richard Gould was living in Whiting Street, Bury St Edmunds in Suffolk, a landed proprietor and widower aged 70 born in Bakewell. With him were two grandsons, John Hinde aged 13 born at Poona in India and Charles Hinde aged 11 born at Harrackee in India, the sons of his younger daughter Frances and her husband Major General John Hinde 1814-1881. 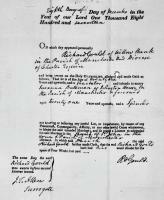 Richard Gould died on 18 July 1868 at Great Yarmouth in Norfolk (2). (1) Morning Post 16 December 1817; Lancaster Gazette 20 December 1817. The bride's father was then living at Islington House in Manchester. See also: A History of the Brazil: comprising its Geography, Commerce, Colonization, Aboriginal Inhabitants, etc. J. Henderson (1821) page xv (List of Subscribers). (2) "24 October 1868. Letters of Administration of the Personal estate and effects of Richard Gould late of Great Yarmouth in the County of Norfolk Gentleman a Widower deceased who died 18 July 1868 at Great Yarmouth aforesaid were granted at Norwich to Susanna Milne (Wife of the Reverend Henry Milne, Clerk) of Holme Hale in the County aforesaid the Daughter and one of the Next of Kin of the said Deceased she having been first sworn." Effects under £1,500. National Probate Calendar (Index of Wills and Administrations) 1858-1966 (1868) page 318.